Hey that's pretty good. 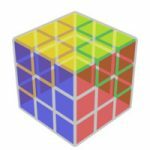 Cube was a Boron Valk M, which is not available for purchase, a very similar cube can be purchased here : https://thecubicle.us/cubicle-valk-p-7936.html Sponsored by Qiyi Mofangge Cube and TheCubicle.us! Qiyi: https://www.facebook.com/mofanggecube/ TheCubicle: http://thecubicle.us/ My Instagram: https://www.instagram.com/patrickponce29 This video is being managed exclusively by Newsflare.